Our Chalet, which lies opposite the hotel, has 15 comfortable 3-star rooms (without a lift) decorated in alpine style. 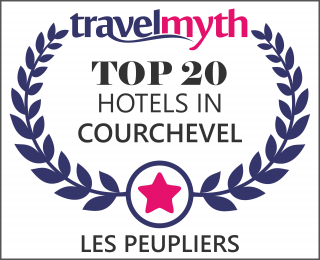 The rooms can accommodate up to 6 guests and are ideal for a stay with family or friends in Courchevel. The Chalet has its own ski room in the basement. It also provides direct access to the ski lifts, allowing you to set off with your skis on for a day in the 3 Vallées. Breakfast and other meals are served at the restaurant, La Table de Mon Grand-Père. The Spa (sauna, steam room, Jacuzzi, relaxation area) are also housed in the main building. The 15 rooms of the Chalet, opposite the hotel, offer a peaceful environment. Ten of the rooms overlook the lake, while the other five offer views of the garden.